Eva Mills, right, and Holden Grzywacz, two survivors of the Las Vegas mass shooting, mourn the death of Sean Adler during a vigil. They found themselves in a terrifyingly familiar scene on Wednesday night, when bullets began flying once again. This time, gunfire claimed a Navy veteran who had lived through the deadliest mass shooting in modern US history a year ago. 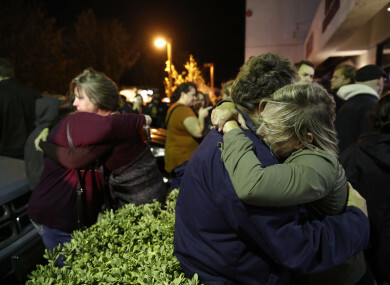 “I already didn’t wish it on anybody to begin with for the first time,” Brendan Kelly said last night outside his Thousand Oaks home. The mother of the 27-year-old man killed in the latest attack , Telemachus ‘Tel’ Orfanos, said her son survived Vegas only to die inside Borderline, less than 10 minutes from his home in suburban Los Angeles. “Here are my words: I want gun control,” said Susan Schmidt-Orfanos, her voice shaking with grief and rage. Kelly has a large tattoo on his left arm memorialising the Las Vegas shooting, which killed 58 people. On his other arm last night, he still had his wristband from the California bar. A few weeks after the Vegas shooting, the bar held a benefit concert for five people from the area who were killed, and now-eerie social media posts show a number of survivors holding up a “Route 91″ sign inside the bar at a six-month anniversary event. Email “Man who survived Las Vegas shooting was killed in California bar mass attack ”. Feedback on “Man who survived Las Vegas shooting was killed in California bar mass attack ”.